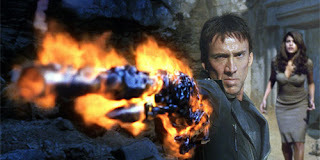 Cam's Cinematic Episodes: Film Review: GHOST RIDER: Failing To Ignite, This RIDER Stalls. Film Review: GHOST RIDER: Failing To Ignite, This RIDER Stalls. I generally have a rule about writing movie reviews on here. I usually don't like to write reviews for films that have been released for a week or over. I figure no one cares by then. Well, I'm going to break that rule today because I'm annoyed. Let me tell you why. Last night I finally got to see the eagerly awaited Ghost Rider. It should have been a good experience. It wasn't. Instead, I witnessed a perfect example of how to make a lousy comic-book adaptation. But first, the required exposition. 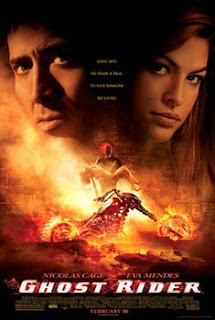 Ghost Rider (incompetently) tells the tale of stuntman extraordinaire Johnny Blaze (Nicolas Cage). As a lad Johnny made a deal with the devil Mephistopheles (Peter Fonda) to save his father, Barton Blaze, from cancer. The devil took Johnny's soul in exchange for allowing his father to be cured of cancer. As Johnny found out though, the devil is a slippery bugger and his father died soon after in a motorbike stunt gone awry. Flash forward 25 years. Johnny is a stuntman of rock star proportions, surviving crashes that would make Super Dave Osborne cry. It's at this point that the devil comes a-callin'. Seems, Mephistopheles' emo son Blackheart (Wes Bentley) has escaped hell and is l ooking for a poorly explained scroll that will somehow make him a ruler of Earth. Johnny then becomes the Ghost Rider, a flaming skull-headed creature of the night, using a flaming chain and ghastly stare to stop evil dead in its tracks. The poor dumb sap then has to defeat Blackheart and his clown-shoe minions and fight for the love of vacant-eyed news reporter Roxanne Simpson (Eva Mendes). Whew. While that paragraph may seem like sheer nonsense, it is far better laid out than anything you will witness in Ghost Rider. This is a film in which the filmmakers examined the source material, underestimated its potential, and decided to make a lowest-common denominator B-movie. Director Mark Steven Johnson (Who I thought did a pretty good job with Daredevil) surveyed the comics-to-film landscape and decided to steer away from films like Batman Begins, Spider-Man or Superman Returns, and instead aimed for Elektra and Blade: Trinity territory. It's harder to fail when you try to accomplish so little, I suppose. As the love interest, Eva Mendes is bottom of the barrel. Her Roxanne is possibly the stupidest woman to appear in a comic-book film (That's saying something after Elle Macpherson's acclaimed performance in Batman & Robin). There is no depth to the character. She's merely in the film to wear clothes usually reserved for escorts, and to be kidnapped. Eva Mendes is not good... But then it's hard to excel when you're playing a blank slate. It's funny. Just the other day I lambasted Tommy Lee Jones' Two-Face for being the worst villain ever in a comic-book movie. Well, not anymore. Blackheart, played by Wes Bentley (The video-camera pervert in American Beauty - Pictured center), has the charisma of a peanut. When not pouting and looking like a Hot Topic reject, he's making unconvincing threats and mincing like a boy-band member. He makes the actors around him seem like the cast of a Scorsese or Altman flick. And in this film, that's an achievement. He lacks any menace, and makes Jim Carrey's flamboyant Riddler from Batman Forever seem like Leatherface or Michael Myers. Even Blackheart's big transformation scene is almost a complete carbon copy of Stephen Dorff's climactic moment in the first Blade. A host of spirits flying around and through him? Check. Red eyes? Check. Cheesy sneer? Check. Cool death? Whoops. The rest of the cast does what they can, but ultimately fails due to the material. Peter Fonda has the silky charm, but his lines are so terrible that his devil isn't very interesting. Donal Logue, as Blaze's best friend, disappears for long stretches at a time, popping up randomly and for no real purpose. Sam Elliott (Pictured), as the mysterious Caretaker, is t he only actor who's effective, but then when is Sam Elliott ever not effective. He's wasted here. The film is a cut-and-paste hack job from beginning to end. Scenes seem random and without any gravity. The film is filled with dramatic scenes stripped of weight and lousy "comic relief" moments. I don't mind humour in these movies, but the jokes here are painfully hokey. Even the action scenes are lifeless and unexciting. The only area in which the film is a success is in the area of special effects. The Ghost Rider himself is glorious to behold. The CG flame is dead-on and he has real weight as a character. He is interesting to watch and his scenes are the only moments in which the film takes flight. I can't call this film a complete failure, as it nailed the Ghost Rider. But it's a cinematic bomb of characterization, plotting and structure. While it's never boring, it's complete lack of ambition and inventiveness prevents it from being anything but watchable trash. I truly hope Marvel snatches this franchise away from Mark Steven Johnson for the inevitable sequel. Giving it to a director with ambition and an original vision would do wonders for this materia l. Maybe then the Rider will truly get his due.